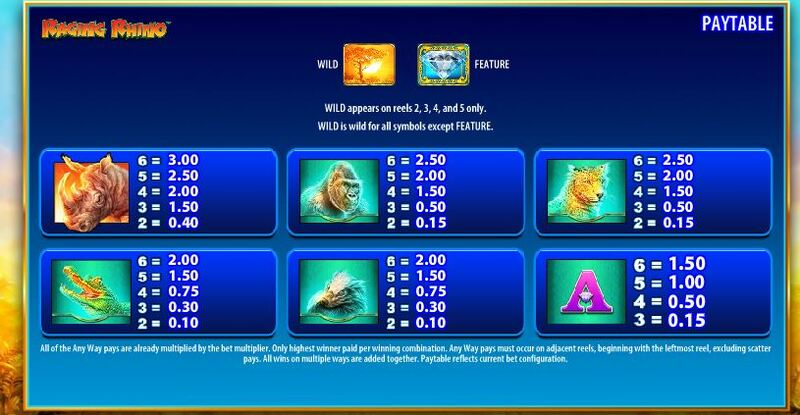 Raging Rhino slot has become perhaps the most famous WMS game over recent years. 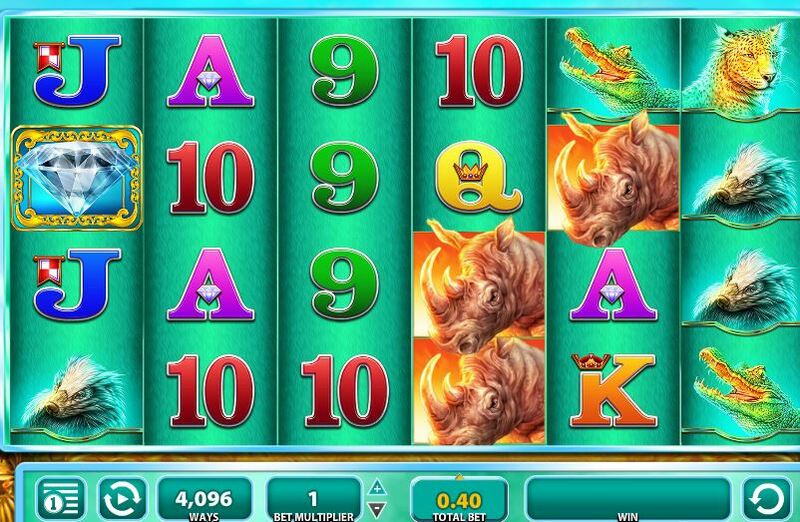 Based on Bally’s Thunderhorn and similar Aristocrat slots like Buffalo with 5 reels WMS have extended the game to 6 reels and made it a highly volatile 4096-way beast! The game is centred on orange Rhinos positioned on all 6 reels stacked 3-high on reels 1, 5 and 6 and 2-high on reels 2, 3 and 4. These pay a mere 7.5x stake for 6-of-a-kind but as you may have worked out that is due to multiple ways it’s possible to hit them. Other animals feature in this African Plains themed game like Cheetahs, Gorillas, Crocodiles and Honey Badgers. Like the letter and number symbols they all appear in stacks of 2 and 3 on some reels. Diamonds appear on all reels and drop in with a distinctive ‘crash’ noise and if you can use the autoplay you’ll notice the button grey-out before the reels stop when the 3 or more diamonds necessary for the free games are going to land! 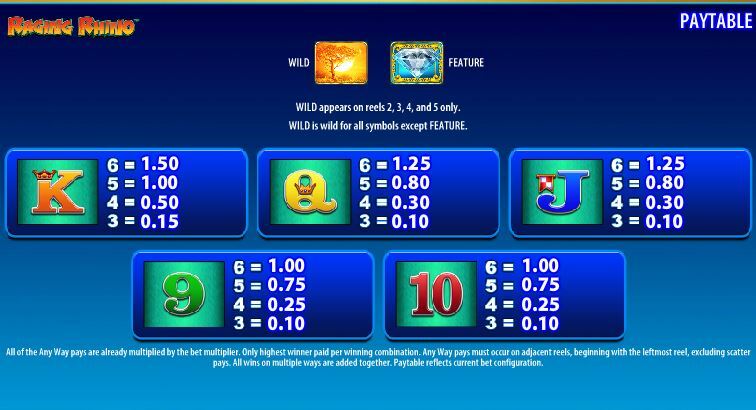 The Flame Tree Wilds appear on the centre 4 reels but in the free games they are allocated a random 2x or 3x cumulative multiplier. You could therefore hit up to 729-ways of 6 Rhinos for a thundering win of over 5500x stake along with any Crocodile wins that would appear too. 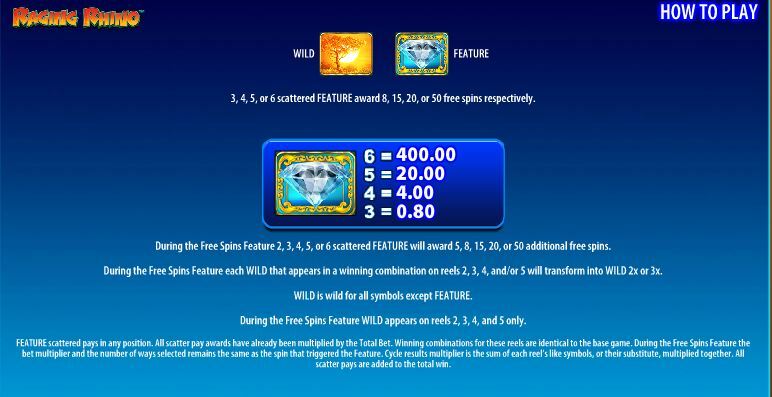 Two Diamonds award 5 more spins plus retriggers can occur and it’s not uncommon to accumulate over 100 free spins on Raging Rhino slot. It’s brutally volatile though, and you get a ‘Bonus Guarantee’ if you win less than 10x stake in the free spins – alas far more common! RTP is 95.91%.